Steel Parts Manufacturing, Tipton, IN, is a contract metal stamper that provides stampings and assemblies to the Tier One and Tier Two marketplace. Early in 2009, the firm aimed to capitalize on an opportunity to bring in takeover work, as a Tier Two automotive supplier, from another stamping company in Southern Indiana. To do so, it had to make some capacity decisions to accommodate this shift in work without disrupting its customer’s workflow. A 600-ton Aida press that used to run progressive and hand-transfer dies at Steel Parts Manufacturing now runs three different transfer-die sets, two of which are transmission stampings the firm took over from another stamper. In the end, management decided to add a transfer system to its 144-x 72-in. 600-ton Aida link-motion press to increase capacity and process the additional work—a pair of transfer tools for six-speed transmission components. After discussing the project with HMS Products Co., Troy, MI, regarding a few front and rear-mount full-servo transfer system, and accounting for less-than-stellar market conditions, the firm decided that it could not justify the capital outlay for new transfer equipment. Instead, SPM decided to seek a solution on the used-equipment market, looking for a system that would suit its press and stamping process. After some searching, in March 2009 HMS managed to locate for SPM a used HMS Series 600 servo-mechanical transfer system. SPM then contracted HMS to procure the system, refurbish it, set it up at the factory to qualify it, and then run it off. The transformation had to occur in a very aggressive timeframe. Having brought in the dies for the parts, production operators at SPM were running multiple shifts in hand-transfer mode to keep pace with the existing production requirements. SPM sent existing tooling and station samples to HMS for evaluation and modifications in order to run in the newly automated press. Over a two-month timeframe, HMS went to work refurbishing the transfer system. Mounting attachments were reworked, guides torn apart and reworked, controls were upgraded and a fresh coat of paint applied. Once the equipment was ready, HMS and SPM engineers worked closely to create a window to commission the equipment and to support limited production runs. Due to price-point and timing requirements, the two companies decided that SPM should use the existing transfer-finger tooling as a starting point. Considerable modifications to the dies were required to get this process to operate in this press and transfer system. These modifications—primarily to guide mechanisms—were driven by differences between the original transfer system and the refurbished HMS system, and in the press characteristics. Press stroke went from 24 in. down to 16 in. with the Aida press, and clamp-axis travel went from 13 to 14 in. down to 8 in. with the HMS transfer system. These changes were accommodated for during a series of Internet-based design-collaboration meetings between HMS Engineering, SPM’s engineering department and the die vendor. 12 strokes/min. to 27 strokes/min., because transfer motions became more relaxed and part handling became more reliable. • Additional equipment to improve quick-die-change (QDC) capability. 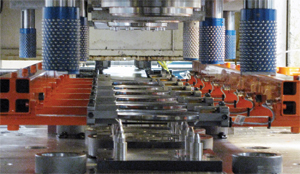 The volumes for the transmission components were scheduled to increase rapidly, and at the same time SPM decided to configure a third part for the newly automated press. This part had been running in an in-die transfer system that was exhibiting reliability problems. During phase two of the project, SPM engineers went to work revisiting the finger tooling used for the first two parts, while enabling the tooling to accommodate the third part from the in-die transfer tool. They also sought to incorporate swing-gate access to the press bolster to optimize conditions to implement QDC procedures. Successfully implementing this phase required a complete die review and optimization as a function of new transfer-finger tooling developed for all three stampings. While during the first phase the transfer system had to mimic the existing timing curve developed with the existing transfer system and longer press stroke, during phase two HMS and SPM worked to generate new timing curves. Finger engagements were considered and clearances modified within the dies based on optimized timing-curve data. HMS designed and manufactured an engineered transfer tool to replace the fabricated tooling that had been in use, which featured an open-top shovel design. 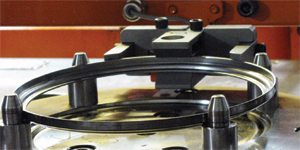 The new engineered tools, installed in January 2010, have proven to be much more rigid, and the fingers were precision machined for each part stage—parts are gripped front to back, top to bottom and left to right, extremely secure. And, new flat-pack sensors were added, replacing aging sensors so that sensing range was increased and the likelihood of nuisance faults minimized. The improvements were immediate and considerable–press speed jumped from 12 strokes/min. to 27 strokes/min., transfer motions became more relaxed, and part handling became more reliable.